Solar flare AR2443 released a burst of particles toward Earth, creating a small solar storm. Just in time for the flu season, it looks like the Earth is going to catch a bit of the sun's sneeze, following a solar eruption yesterday (Nov. 4). Earth's stellar neighbor blasted off a loogie of charged particles — called a coronal mass ejection — when sunspot AR2443 had a medium-class eruption, which NASA's fleet of solar satellites captured. The sunspot is nearly 10 times the diameter of Earth from end to end, at roughly 124,000 miles (200,000 km) wide, according to SpaceWeather.com. While the sneeze is in the right direction to hit Earth on Saturday (Nov. 7), it looks like the planet's atmosphere will catch just a mild case of auroras when the particles hit. Spaceweather.com predicted a "glancing blow" that could generate a low-grade storm in the upper atmosphere. The storm is forecasted to be a G1 (on a scale spanning G1 to G5), which can produce auroras in high latitudes, and can have some minor effects on power grids and satellite operations. Auroras are produced when charged particles from the sun interact with the Earth's magnetic field. Charging in the upper atmosphere "excites" molecules that are high up, producing a ghostly glow. There could be more action yet from AR2443. 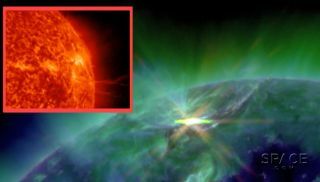 The sunspot is currently near the sun's equator, and has the potential to produce a medium or M-class solar flare, SpaceWeather.com added. There are four classes of solar flares, with M being the second most energetic, superseded only by X-class flares, which have the potential to cause power-line disruptions and damage electronics on satellites. Smaller eruptions, however, mainly produce a fun light show for skywatchers to observe, particularly near the poles. The sun is just coming off the peak of an 11-year cycle of sunspot and magnetic activity. While the processes that produce solar bursts are still not fully understood, scientists have seen flares occur when magnetic field lines become twisted on the sun's surface. Follow Elizabeth Howell @howellspace, or follow Space.com @Spacedotcom. We're also on Facebook and Google+. Original article on Space.com.